DO YOU realize God has purposely closed much of the Holy Bible from human understanding, until now? Even the prophets inspired in writing the Word of God did not understand much of what they wrote. Daniel records in his last chapter. "I heard this, but I did not understand it" (Moffatt translation). When he asked the meaning of what he was inspired to write, he was told: "Go thy way, Daniel: for the words are closed up and sealed till the time of the end" (KJV) — or, as Moffatt translates it, "till the crisis at the close" (Dan. 12:8-9). The whole world is now in chaos — we have now entered the world-crisis at the CLOSE of this age! But even now, Daniel was told, "the wicked shall do wickedly; and none of the wicked shall understand; but the wise shall understand" (verse 10). "The fear of the Lord is the beginning of wisdom: a GOOD UNDERSTANDING have all they that do his commandments" (Ps. 111:10). Again God's angel caused Daniel to record: "But thou, 0 Daniel, shut up the words, and seal the book, even to the time of the end: many shall run to and fro, and knowledge shall be increased" (Dan. 12:4). Yes, much of the Word of God, especially the prophecies, were shut up and sealed until now. Today people run to and fro, all over the world, in automobiles, trains and planes. Today knowledge has been increased. We have reached the world-CRISIS AT THE CLOSE of this age! The wise — those who fear God and keep His commandments — can now UNDERSTAND! Even 50 years ago this true understanding was still closed and sealed! None of the established church denominations has been willing, in these 50 years, to admit error, correct false teachings or accept new light now suddenly revealed! No wonder they all disagree! They are in BABYLON — CONFUSION! In the first place, none can understand by himself. The carnal mind cannot see spiritual things. These truths are revealed through the indwelling of the Holy Spirit — and God gives His Spirit only to them who OBEY Him and keep His commandments! Only the truly converted can even begin to understand. But even having that beginning, there are SEVEN KEYS needed to unlock these closed doors of truth! And just as one key alone will not unlock your safety deposit box at the bank, so no one, no two or even six of these keys will open the scriptural doors to full UNDERSTANDING. It requires ALL SEVEN KEYS. Christ gave His apostles the keys of true UNDERSTANDING, which unlock the door to the KINGDOM OF GOD. And so naturally, today no denomination of traditional Christianity, sect or church possesses these seven KEYS! Today people are led to believe that the Gospel is telling the story about Jesus — telling people about a Savior, they believe it is "the Gospel of salvation," not understanding the true way of salvation themselves! No wonder there is NO POWER in what is falsely preached as the "Gospel" today! The Gospel of Christ "is the POWER OF GOD unto salvation." Today most popular denominations do away with all that is vital in Christ's Gospel, saying He was preaching only to Jews under the old covenant! What ignorance! What is Christ's Gospel? What is the message God sent to mankind by Jesus Christ? It is the GOOD NEWS of the KINGDOM OF GOD! Kingdom means GOVERNMENT! It is the message of Divine Government — government by GOD'S LAWS! It is the prophetic proclamation of the coming WORLD GOVERNMENT to rule all nations and bring today's confused, chaotic, war-weary earth PEACE and JOY! It is the vital, dynamic, powerful living message of GOD'S GOVERNMENT, first in individual hearts in God's true Church, now in this world, later all nations internationally in the WORLD TOMORROW! Of course that power-filled message includes the knowledge about the Savior, High Priest and coming King! Of course, it includes the true way of salvation, which the churches seem to have lost! And it includes also knowledge of the location of the TERRITORY to be ruled over by the King of the coming Kingdom — the fact it is this earth and not heaven! But there can be no GOVERNMENT without LAWS, and so the TRUE GOSPEL also must proclaim the LAW of God, which alone can bring peace to the world and success, happiness and joy to the individual! The TRUE GOSPEL has to do with the nations of today's world, world conditions today and Christ's reign over all nations in the WORLD TOMORROW! It is a full, complete, dynamic and POWERFUL Gospel, which has been kept by the powers of darkness from the world for 1,900 years! This knowledge is the first key! God, so the world has been taught by church leaders, had completed His work of creation — man was a finished creation, spiritual, immortal, perfect in character. Then along came Satan, and by cunning he wrecked God's handiwork, thwarted God's purpose, caused man to fall to the low plane of sinful human nature, ruined God's perfect creation! Then God is supposed to have looked down upon this colossal smashup, and to have thereupon thought out THE PLAN OF REDEMPTION as a means of repairing the damage. Salvation, then, is presented merely as God's effort to restore man to a condition as good as Adam was in the first place. The picture is that God has been doing His very best for 6,000 long years, but Satan has resisted Him! God has found Himself unable to avoid a CONTEST with Satan — a "GREAT CONTROVERSY" as one writer phrased it — in which God has done His best, but Satan has continued to outsmart Him and now today, with TIME ABOUT UP, the vast majority of people on earth are still unsaved — still on Satan's side! The contest is almost over, and the best God can now do is take revenge, and soon send Christ to DESTROY ALL THE WICKED whom Satan has kept on his side! Can you see that picture could only have come from the deceiving false GOD OF THIS WORLD, Satan himself? It presents Satan at every turn as more powerful than God — as succeeding in his rivalry! This entire concept is a damnable LIE! The TRUTH is the second important KEY — and it explains GOD'S PURPOSE in placing humanity on this earth! Salvation is not a "repairing of the damage" done by Satan in the Garden of Eden. Satan never did alter or change God's purpose or plan. The devil has never thwarted God's will. All has gone always, and always will, exactly according to GOD'S PURPOSE! Salvation is merely the COMPLETING of CREATION! Creation was not completed 6,000 years ago, at the time described in Genesis 1! That was merely the first or material phase of a creation now still going on! What God then created was physical — material. The spiritual creation is a process, continuing, according to God's plan, today! Man was created PHYSICAL, not spiritual — MORTAL, not immortal — of the dust of the ground — the clay model that God the Master Potter is now fashioning and shaping, spiritually, into the FINAL image! Man was created purposely, in the mere PHYSICAL image of God, a free moral agent, with the possibility revealed to him of receiving as God's gift the very spiritual nature of God, so that he may by God's power be made into a perfect, righteous, spiritual character, then given immortality as God's gift! There is no contest! Satan does nothing except what God permits! And God permits it FOR A PURPOSE. Character is created by experience, and experience requires time, and therefore it is a process! As Christ our example learned by suffering, so do we! The fact that SALVATION IS THE COMPLETING OF CREATION — the spiritual phase of Creation — that GOD'S PURPOSE is to create in us, as free moral agents who make our own decisions, the supreme masterpiece of all His creative acts — holy, righteous, spiritual, immortal CHARACTER — resisting the downpull of Satan and self-desire, LIVING by GOD'S LAWS — that knowledge of GOD'S PURPOSE is the second vital KEY! A duality runs through every phase of God's plan. First, the material creation of Genesis 1, completed; second, the spiritual creation still in process pictured finally complete in the prophecy of Revelation 21 and 22. There was the first Adam, material, of the earth; and there is the second Adam, Christ Jesus, spiritual, from heaven. There was the first covenant with Israel, material and national, devoid of salvation, based upon the birthright promise; and there is the NEW covenant, spiritual and individual, with a spiritually begotten Israel, based upon the scepter promise. God made man mortal, of the dust, in order to convert him in to immortality, composed of Spirit. In this very salvation process is the DUAL METHOD — the very word salvation means, first, rescuing from the penalty of eternal death, and second, the act of preserving or imparting eternal life as God's gift. And so, in being saved, we first are now begotten of God by the indwelling of His Spirit in our mortal bodies as the temple or house of the Spirit — and are now merely the heirs of salvation; and second, we shall finally be fully born of God at the resurrection of the just, when we shall inherit the Kingdom. This same DUAL PRINCIPLE runs all through prophecy! First, a former or preliminary fulfillment that is merely the type or forerunner of a second, the final climactic fulfillment occurring, usually, during this CRISIS AT THE CLOSE we already have entered! And positively none can understand the Bible prophecies unless this DUALITY of fulfillment is understood. It is a vital key! These were given to God's people to picture and to keep them in the understanding of God's PLAN for bringing about His purpose — His reign over all the earth whose people shall have been converted to righteous immortality! Every sect, organization or denomination that does not observe God's Holy Days and fastened its eyes upon the pagan Romish holidays instead, has never understood the knowledge of GOD'S PLAN! First, Passover, the crucifixion of Christ. Second, Feast of Unleavened Bread, putting sin out of our lives, or, keeping God's commandments — and during this Festival was the wavesheaf picturing the resurrected Christ accepted of God as our High Priest. Third, Feast of Firstfruits or Pentecost, picturing the coming of the Holy Spirit and the completing of this, the merely first and preliminary harvest of souls. Fourth, Feast of Trumpets on the first day of the seventh month, picturing the Second Coming of Christ at the beginning of the seventh millennium at the last trump. Fifth, Day of Atonement, picturing justice done by laying Satan's guilt in our sins upon his own head, removing him and chaining him in the symbolic bottomless pit, making us finally AT ONE with God. Atonement means at-one-ment. Sixth, Feast of Tabernacles, for seven days, picturing the KINGDOM OF GOD during the seventh millennium, the great fall harvest of souls. And seventh, the Last Great Day, immediately following the Feast of Tabernacles, picturing the final Great White Throne Judgment, which almost nobody today understands, and the final COMPLETING of God's plan! The fact is that the nation Israel became divided into two nations. The 10-tribed kingdom retained the name the kingdom of Israel, possessing the birthright promises. The kingdom of Judah, composed of Judah and Benjamin and a large portion of Levi, possessed the scepter. Another fact revealed during this time of the end is that the Jewish people today are merely a portion of the descendants of the kingdom of Judah; and the Americans, British and democracies of Northwestern Europe are the so-called "lost 10 tribes". They are descended from the house of ISRAEL Britain is Ephraim, and the United States is Manasseh, co-holders of the birthright, which is the true explanation of our sudden rise to the greatest national power and wealth ever possessed by any nation. God has concealed until now His prophecies of these colossal end-time world events now occur ring by means of SYMBOLS used to describe these events — as well as by the fact of His dual principle and that our Israelitish identity has been hidden from men. Symbols, like parables, were used, not to make the meaning clearer, but to hide and conceal God's true meaning until the time came for Him to reveal the interpretation of the symbols. Just as Jesus' parables were not understood until Jesus Himself explained them in plain language, so with symbols. For generations men have been putting human interpretations upon God's symbols. An important KEY, therefore, is that these symbols are interpreted in plain language in the Bible itself, if not in the context, then elsewhere, and we must search for God's own interpretation, never apply our own. Since this is the test Commandment — the one most professing Christians refuse to obey — the one that causes the greatest test of faith and reliance upon God to be able to keep it, it stands as the final completing basic key — for "A GOOD UNDERSTANDING have all they that do his commandments"! Also it is the basic key to the identity of ISRAEL The house of Israel threw away this key to their identity — and thereby became the "lost 10 tribes!" The great majority of the house of Judah likewise threw it away and lost their identity — not known even today! The Jews who returned to Palestine under Ezra and Nehemiah became strict sabbatarians and have remained so to this day — and therefore the world looks upon them as ISRAEL (because they carry Israel's identifying SIGN) although they are not Israel, but only a small portion of JUDAH! 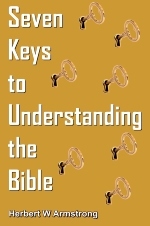 This completes the KEYS TO UNDERSTANDING — the KEYS to the KINGDOM OF GOD! The churches have lost these KEYS! No wonder they are all mixed up, in confusion, each claiming the Bible says something different, none understanding ITS TRUE MESSAGE! Out-of-date in the nuclear age? A collection of ancient superstitions? Or the most up-to-date book available? You need to know! WHAT a paradox. The Bible is consistently on the best-seller list. Yet for many who have a copy it is one of the least read and most often misunderstood of books. The chances are, if you have a Bible in your home, it primarily occupies space on the bookshelf. Or it sits on a coffee table as part of the living room decor. Or it's there in the nightstand drawer by your bed. But read it? Understand it? Not many do. Why should that be? The Bible is the oldest used book known to man, and at the same time the most up-to-date book available. So why don't people read the Bible? There are probably as many reasons as there are people. Few know that in its pages are revealed the purpose of man, the reasons for the course of human history and prophecies of what is to come upon this generation. You would think more people would want to understand these things. Is it any wonder that the Bible has been viewed as a book you can't understand. Author Bruce Barton referred to it in a book title as The Book Nobody Knows. And that has generally been true. Not many people have understood the Bible. While listening to The World Tomorrow on radio more than 30 years ago, I decided to accept Herbert W. Armstrong's challenge, "Blow the dust off your Bible. Read it. Find out what it really says. You'll be shocked at the truth of your own Bible." I decided to start reading the Bible. Like many American homes, ours had a Bible or two. But I had not read it. In Sunday school, we sometimes read some verses, but usually we had quarterlies and lesson plans. During worship services no one took a Bible. The minister usually had a text for the message of the day. It seemed to me the Bible was a book for only ministers to read. Mr. Armstrong challenged listeners, "Get out your Bibles. Read the scriptures. Prove whether what I say is true or not." I decided to read the Bible. I didn't know where to start or how to go about it, so I decided to begin at the beginning. That made sense. I started with Genesis 1:1, "In the beginning God created ...." I got through the first four chapters — how God made the heavens and the earth and all life — the account of the first humans in a garden (familiar from Sunday school) — and the story of Cain and Abel. Then I came to Genesis 5. Here was a whole chapter of hard-to-pronounce names and somebody begetting somebody else who, in turn beg at yet another. I couldn't understand why all that was important. But I read on. The story of the Flood in chapter 6 was a challenge — and the repopulation of the earth in the following chapters. Then came Genesis 10. Another whole chapter of names — even harder to pronounce than those in chapter 5. "I just don't understand all this," I said to myself. I put the Bible back on the shelf. There it sat for more than three years. Maybe you have had a similar experience. If so, it's time to try again. You might find, as I later did, studying the Bible can be very rewarding. The Bible became a fascinating book. I discovered one third of the Bible is prophecy — not ancient, dead history — but up-to-date vital information. Most Bible prophecy has not yet happened. So when you read the Bible, you are reading about events soon to occur — probably in the lifetimes of most of you! How can you read the Bible with understanding? How can you experience the excitement and — meaning for today of ancient history and battles of long ago? How can you understand the times in which you live and understand the meaning of world news in the light of Bible prophecy? You have to read the Bible. If you have not read the Bible through at all, or in recent years, you might like to make a special project of reading the entire Bible during the next year. You will then have an overview of what the Bible is all about. If you would like to begin such a program, you can complete the Bible in one year by reading about 23 chapters each week. That means reading between three and four chapters each day. No doubt there will be days when you simply do not find time to read. But it should not be hard to catch up on the weekend or at another convenient time. Never let yourself fall too far behind, though. Catching up after a long delay will prove too hard for many — there will be a temptation to quit. So stay with it. As you read, there will no doubt be many questions you will have. Make notes on those questions and look for the answers as you continue to read. Perhaps you will be encouraged to look up answers by doing further research at the library. Discuss your questions with other members of your family. Feel free to write us at one of our offices — the addresses are listed on the inside front cover of each issue of The Plain Truth. We probably have a booklet or reprint article we can send that will answer many of the most often asked questions our readers have. But be prepared for a few surprises. You are going to find the Bible says some things you have not heard before. Things you thought were in the Bible are not in there. For example, you will not find the modern celebrations surrounding Easter, Christmas, Valentine's Day or Halloween in the Bible. You will find instead that the New Testament Church continued to observe days God made holy rather than modern holidays of pagan origin. You will find the Bible tells you how to have a happy marriage, good health, successful children and how to have a close personal relationship with the Creator God. The apostle Paul wrote Timothy about the Bible, "All scripture is given by inspiration of God, and is profitable for doctrine, for reproof, for correction, for instruction in righteousness" (II Tim. 3:16). This brings us to another way to study the Bible. While it is fine to read the Bible through, it is good to have other methods of Bible study. Above all we should want to understand the Bible. I am reminded of the story of a young pastor, who with his wife excitedly visited the members of his congregation to become acquainted with them. One elderly gentleman lived way out in the hill country and didn't make it to the services frequently. So they went out to visit him one day. They drove up to his property and inquired if they might visit. He eyed them up and down and said, "So yer the new preacher, huh?" "Yes, sir," the pastor replied. "Kind of a young feller, ain't ya?" he asked. "How many times you read the Bible through?" "Sonny," he said, "I've read the Bible through from lid to lid nigh unto 40 times. Now what do you think you kin teach me?" That elderly gentleman had read the Bible over and over — but he didn't understand what it said. He didn't understand that it is a book to educate a person spiritually. Perhaps the most important key of all in Bible reading and study is understanding. When you set out on your course to study the Bible, pray for guidance, wisdom and understanding. The first step is to have a suitable Bible to read and study. This does not always mean having to purchase a new Bible, but for many, a new Bible provides inspiration to study. If you plan to purchase a new Bible you will find a host of choices at the bookstore. There are big Bibles, pocket-sized Bibles, old translations, new translations, leather bound, cloth bound, paper bound, inexpensive editions, expensive editions. The choice is almost limitless. But here are some helpful hints. Spend a little extra to buy a quality binding. It pays off in the long run. If you can afford it, buy an edition with India paper, leather binding and margins wide enough to make some notes as you study. Also be certain the print is large enough to be easily read. An edition with a center reference column can be helpful if you wish to locate scriptures on the same subject. If you would like to make notes, use a black-ink ball-point pen (red and blue ink tend to soak through the paper). A set of colored pencils can aid in underlining and marking words and passages of interest. Some people develop their own special marking system using colors to signify different subjects. The main point is to develop a plan that will help you read, remember and understand the Bible. Do whatever is necessary to help you. The physical surface of the pages of the Bible is not holy or sacred. The living Word of God is. So use what will help you in your study of God's Word. A well read and well marked Bible is invaluable. Another way to read and study the Bible is by subject. Perhaps you would like to study about specific subjects such as you read of in the advertisements in the pages of The Plain Truth. This is where study aids come into play. First in importance is a concordance. A concordance is a book that lists most of the words in the Bible and tells where they are used. Let's say you want to look up the word understanding. In the concordance you would look up the word just as you would in a dictionary. There will be a list showing every time the word understanding is used in the Bible. You can look up each scriptural reference if you want — or select a few to read. When you do look up understanding, pay attention to what is revealed in what you read. You will be surprised at what the Bible says is the basis of a good understanding. Once you have mastered the concordance, you might want to purchase a one-volume Bible dictionary. In such a reference work you will find a short explanation of historical events and background information on personalities of the Bible. For example you might like to read about Jezebel, the infamous wife of King Ahab of ancient Israel. In a Bible dictionary you could read a short sketch about her colorful life. If you want more detailed information, there are encyclopedias available at public and other libraries where you can go for certain detailed study. In fact, it's not a bad idea as you study at a library to spend a little time and read up on subjects such as "Christmas," "Easter" and "Halloween." A question many people ask about Bible reading and study is, "Do I need to understand Greek and Hebrew to understand the Bible?" The answer is no. The Bible has been translated into more than 1,400 modern languages and dialects. While there are a few places in which translation problems exist, they are most often corrected by checking a different translation of the Bible or a commentary, dictionary or encyclopedia. As you become more and more familiar with the various study aids, you will see which ones will help you most. Another important aid is a modern translation of the Bible. In the English-speaking world, the traditional Bible has been the King James edition of 1611. But a more modern language translation can be helpful. And there are many available. Again, a public library is a good place to start to see which ones you enjoy most. I have found three modern English-language editions suitable for basic reading Bibles the Revised Standard Version (RSV), the New International Version (NIV) and the Revised Authorized Version (RAV), which is called in the United States the New King James Version. There are other translations also that you might find to your liking. The Bible is a book that tells you not to accept what you hear preached — just because you heard a preacher preach it. God says through the apostle Paul, "Prove all things; hold fast that which is good" (I Thess. 5:21). And Paul told Timothy, "Study [give diligence] to shew thyself approved unto God, a workman that needeth not to be ashamed, rightly dividing the word of truth" (II Tim. 2:15). Follow the examples of the Bereans in ancient Greece who "searched the scriptures daily, whether those things were so" (Acts 17:11). There is nothing more rewarding than reading and studying God's revealed Word. All the adventure and intrigue of history, the instruction of how to live your daily life, all the news of prophecies to come are found in the Bible. It's a thriller such that when you start to read with understanding you will not be able to put down. Why not get started on a Bible reading program right away? To help you understand the Bible as you read it, use the Ambassador College Bible Correspondence Course. It's a helpful Bible study program to guide you in a systematic study of the Bible. It will take you through history, prophecy and how to live a Christian life. It's free of charge, too. You have nothing to lose and everything to gain. A veritable explosion in 20th-century Bible translations is occurring. Some are excellent. Some are tragic. Explained here is the way to choose good translations. In recent years two important new translations of the Bible into English have been completed. The New King James Version — called the Revised Authorized Version — was published by Thomas Nelson in 1982. And a new translation of The Holy Scriptures was completed the same year by the Jewish Publication Society of America. God, of course, speaks to us through His prophets and apostles. And we understand the words of the prophets and apostles, whose voices have been recorded in ancient languages, in translation. But who is to translate? God could have sent holy scribes inspired to translate the words into modern languages for us. But He did not. In a very real sense God is testing the scholars of this world to see how careful they are in translating His Word. He is not now asking His Church to do scholarly translations. But He is testing us to see how careful we are in reading and choosing their translations of the Bible! Living languages change with the passing of generations. King James I of England did not speak the same style of English that U.S. President Abraham Lincoln spoke 2½ centuries later. And we do not speak in the style of either today. That is why the language of the Authorized or King James Version of the Bible seems archaic. And the language of the Revised or American Standard Version produced at the turn of the century seems too literal for easy reading. Another reason for continued translating is the explosion in archaeological and linguistic knowledge. Even in Bible times Hebrew words changed. Moses and Jeremiah did not use Hebrew words with the same nuance of meaning. And Noah's vocabulary was so different that the kind of wood the patriarch used in building the ark is still obscure (Genesis 6:14). Compare, for example, the muddy word-for-word translation of Isaiah 66:17 in the Authorized Version of 1611: "They that sanctify themselves, and purify themselves in the gardens behind one tree in the midst, eating swine's flesh, and the abomination, and the mouse, shall be consumed together, saith the Lord" with the vigorous rendering — based on translating meaning for meaning — in The New English Bible of 1970: "Those who hallow and purify themselves in garden-rites, one after another in a magic ring, those who eat the flesh of pigs and rats and all vile vermin, shall meet their end, one and all, says the Lord." A major difference in style — a graphically clearer meaning! Is it any wonder that the present generation demands something more than the King James Version? It was 2¾ centuries before the English-speaking world recognized the need for revising the Authorized Version of 1611. But the resultant British Revised Version of 1881-1885 was itself revised in less than 20 years as the American Standard Version. Then came the Revised Standard Version of 1946-1952. Its style was so modern — its textual changes so many — that it was vehemently attacked. Yet, looking back 35 years, it seems as if the Revised Standard Version — based on the old way of translating, with word-for-word correspondence — is formal and conservative. To fill the need of modern language versions at different educational levels, scholars in Britain and the United States, with English-speaking colleagues from around the world, have produced eight major modern language versions in 30 years. U.S. Catholics issued The New American Bible the same year. It is based on the old way of translating, but uses a vigorous vocabulary. The New American Standard Version appeared about the same time, published for the Lockman Foundation. The American Bible Society published in 1976 Today's English Version. Its simple English reads like a newspaper and is designed to reach millions of the lesser educated and those who speak English as a second language. In 1978, the New International Version appeared. It is a transdenominational evangelical Protestant work, under written by the New York International Bible Society. The other two major modern translations were mentioned in the beginning paragraphs of this article. This list does not include the dozens of partial or complete translations of the Bible accomplished by individual scholars in the last 100 years. Nor does it include the issuance of The Holy Scriptures, an earlier, major translation by Jewish scholars of the Hebrew Scriptures into English, published in 1917. This is the wrong question to ask! It is never wise to use just one translation. We should ask, instead, which versions or translations are the most carefully worded? Which the most effective for reading? Which preserve the original texts most accurately? And then there is the cost of buying different translations. This is easiest to answer. If you cannot afford a new copy, go to a used bookstore. There are almost always different versions available inexpensively. Now to the other questions. The most carefully worded Bible should be used for study, whenever possible. But that does not mean the most carefully worded Bible is always the most accurate textually or the most readable. Translation is an art, not an exact science. It involves style of expression and choice of text. Translators may be skilled stylists in language or excellent linguists, but not necessarily both. So, which Bibles should we first choose? Notice the use of the plural — Bibles. Begin your reading or study with a minimum of two versions as a safeguard. You may — and should — add others as the need arises, having altogether perhaps seven or eight translations. The wisdom of experience would require that, for older readers, the first two should be the Authorized and the Revised Standard versions. Both are issued in expensive and inexpensive editions. Concordances are available for both. The Authorized Version, prepared during the reign of King James I, set the standard for style in the English language. It is still the most widely used for this reason. Younger readers may prefer to substitute the New King James. The Revised Standard Version of 1946-1952 is a careful translation. It is an authorized revision of the American Standard Version, published in 1901. The text from which it is translated differs significantly from that of the Authorized or New King James Version. By contrast all other recent Bibles are completely new translations into modern English. They are not revisions, but fresh translations from the original languages. The worth of a Bible translation is to be found in its precision and accuracy of meaning. The most logical verses to use as a test are Genesis 1:1-2. The beginning verses of any translation of the Bible reflect the character of the whole translation. Why? Because the first two verses of Genesis in Hebrew are so full of meaning, yet stated so succinctly! How a translator words these two verses reflects his biblical understanding as much as his knowledge of grammar. In fact, the word construction in Genesis 1:1-2 is such that two translations are possible grammatically. But only one of the two translations gives a correct meaning. The other contradicts the plain statement of Isaiah 45:18: "For thus says the Lord, who created the heavens (he is God! ), who formed the earth and made it (he established it; he did not create it in a chaos, he formed it to be inhabited!)." "In the beginning God created the heavens and the earth" is the wording of the New King James Version and most other versions. Now see how verse 2 is rendered in the Authorized Version: "And the earth was without form and void." The New American Standard Bible: "And the earth was formless and void." The Revised Standard: "The earth was without form and void" — deleting and at the beginning of the sentence. The New King James Version reads similarly. The Jewish translation of 1917, followed by the Catholic Jerusalem Bible and the New International Version, clarify the meaning further: "Now the earth was formless and empty." The use of the word now connotes a time distinct from "the beginning." The New International Version, in addition, footnotes the verb was indicating another possible translation : "Now the earth became formless and empty." Now contrast the preceding with the following misleading interpretations. "In the beginning, when God created the universe, the earth was formless and desolate" (Today's English Version). The Catholic New American Bible: "In the beginning when God created the heavens and the earth, the earth was a formless wasteland." The New English Bible: "In the beginning of creation, when God made heaven and earth, the earth was without form and void." The new Jewish translation: "When God began to create the heaven and the earth — the earth being unformed and void...". Each of these translations, though grammatically possible in Hebrew, is unsound and contradicts Isaiah 45: 18. When left with a choice, these translations chose the wrong alternative because they assumed the creation began in chaos. Contrast these with the following interpretations: "The beginning of the gospel about Jesus Christ, the Son of God" (New International Version). "The beginning of the Good News about Jesus Christ, the Son of God" (Today's English Version). These translations imply the book of Mark is Mark's good news about Jesus Christ. This is a total error. Mark wrote about the good news Jesus brought — the message of Jesus Christ that the Father delivered to Him for mankind. That good news is about the Kingdom of God that is about to break into world affairs to bring peace to the earth. That good news includes the proclamation that Jesus is the Messiah, but it is much more. It is consequently wrong to translate Mark l:1 "about Jesus Christ." "After John was put in prison, Jesus went into Galilee, proclaiming the good news of God. 'The time has come,' he said. 'The kingdom of God is near. Repent and believe the good news!'" (Mark 1:14-15). The Gospel of the Kingdom of God is the good news Jesus brought. It was not Jesus' message about Himself or Mark's message about Jesus! Because of the way Mark 1:1 is translated, we put the Revised Standard Version ahead of the New International Version for accuracy. Style and meaning are both essential in a great translation. The Authorized Version, thought to be very modern in its day, possessed lasting stylistic qualities. It shaped English literary expression for two centuries. But changes in pronouns and verb endings, not to mention sentence structure variations through the impact of modern advertising, have required new 20th-century translations. The Revised Standard Version removed both archaic verb endings and pronouns, except in addressing the Deity. The New King James Version even modernized pronouns referring to the Deity. No other modern-language version is more forceful than The New English Bible. But what it gains through style and clarity it often loses in precision and accuracy. It is a reading Bible, but never one's first choice as a study Bible. The Jerusalem Bible wonderfully translates Matthew 24:22 thus: "And if that time had not been shortened, no one would have survived." The Scotsman Moffatt translated: "Had not those days been cut short, not a soul would be saved alive." For nearly 60 years the Moffatt translation has stood the test of effectiveness. In choice of expression the Revised Standard Version is more traditional and less clear: "And if those days had not been shortened, no human being would be saved." The word saved is a correct translation, but the meaning is not as clear as "saved alive" or "survived." Compare these translations with the less-than-fortunate attempt of Today's English Version ("The Good News Bible"): "But God has already reduced the number of days; had he not done so, nobody would survive." Not every modern-language version succeeds equally! This oversimplified "Good News Bible" is hardly more successful in other passages. Among the better modern-language translations by single scholars — we call these "translations" rather than "versions" — is William F. Beck's The New Testament in the Language of Today, published in 1963. A Lutheran translation, it has properly been characterized as "a refreshing translation in simple, precise English." Two other modern-language Bibles have gained vogue. One, The Amplified Bible, was published in 1965. It is an attempt to present various possible translations within the English text — hence the title Amplified. The result is a translation that is redundant, tedious and too often not accurate. Example: "In the beginning God (prepared, formed, fashioned) and created the heavens and the earth" (Gen. 1:1). That is not a valid method of presenting a translation. The second, The Living Bible, Paraphrased, was completed in 1971. It is a readable paraphrase in idiomatic present-day English, but it is not a translation. It is full of imaginative details not supported by the biblical text. It cannot be relied upon! And it should not even be compared to legitimate translations. Far better to spend some time with Ferrar Fenton's translation of the Bible or Richard Weymouth' s or Kenneth Wuest's translations of the New Testament. Or to read The Modern Language Bible (a new and improved edition of the Berkeley translation). A Bible translation may be accurate, but that does not necessarily make the translation correct. For the correctness of the reading is still dependent on the kind of text type chosen for translation. For example, the scholars under King James who prepared the Authorized Version "translated out of the original [Hebrew and Greek] tongues and with the former translations diligently compared and revised." But when the Revised Version was prepared, a whole new world-view of the Greek text of the New Testament had occurred. The Authorized Version relied heavily upon the traditional Greek New Testament text in circulation in Byzantium — the area of Greece and Asia Minor. But a significant number of passages derived from the Latin text of the New Testament were ill-advisedly retained because people were familiar with the Latin Bible, not the Greek, before the 15th century. Over the past four centuries large numbers of early New Testament manuscripts and fragments with many variant readings have been discovered in Egypt and elsewhere in the Mediterranean world. Modern scholars prefer to use them for study of the text of the New Testament because of their age. The Greek-speaking church in Asia Minor and Greece has over the centuries maintained a standard New Testament text. The differences are major. The Greek manuscripts in circulation in Greece and Asia Minor — the areas where Paul preached and to which Paul and Peter and John wrote — preserve major passages of the New Testament not found in early manuscripts from Egypt and elsewhere. These passages include, for example, John 7:53 to 8:11, the account of the woman taken in adultery; Mark 16:9-19; Luke 22:19-20, the Passover account; 24:12, Peter's visit to the tomb; and Acts 18:21 and 24:6-8. These six passages, which in the Greek Church are regarded as Scripture, are only a small part of the story. Altogether, the Revised Standard Version, following manuscripts from Egypt, deletes about 85 other passages, placing them in footnotes. It is inconceivable that the Greeks, among whom Paul preached and to whom Peter and John also wrote — these Greeks, who kept the Passover for centuries on the 14th of Nisan — could be mistaken about their New Testament that they read each week. And it is inconceivable that the Hellenized Egyptians — who were among the first to abandon the Sabbath and adopt Sunday, who abandoned Passover on the 14th of Nisan and adopted a Sunday-morning communion — it is inconceivable that these people carefully and accurately preserved the New Testament without alteration! Let's put the two major text types to a test. The Authorized or King James Version and the New King James Version preserve the reading in Mark 1:2-3 of the manuscripts in circulation among the Greeks to this day. The Authorized Version reads: "As it is written in the prophets, Behold, I send my messenger before thy face, which shall prepare thy way before thee. The voice of one crying in the wilderness. Prepare ye the way of the Lord, make his paths straight." All other modern English versions, with one exception, adopt the manuscript reading of Egypt, popularized in the last century by Brooke Westcott and Fenton Hort. It reads, in the Revised Standard: "As it is written in Isaiah the prophet, 'Behold I send my messenger before thy face, who shall prepare thy way; the voice of one crying in the wilderness: Prepare the way of the Lord, make his paths straight.'" Which is correct? Is it written in "Isaiah the prophet" or "in the prophets"? Look at the footnote in the Revised Standard Version. Mark 1:2 is a quote from Malachi 3:1; Mark 1:3 is from Isaiah 40:3. This example is strong reason for not discarding the King James Version. Modern-language translations alone are not sufficient. They may be excellent translations, making outdated expressions clear. But they need to be compared with the English text of the Authorized or King James Version and the or New King James Version. And for the Old Testament, it would be valuable to compare modern-language translations by Christian scholars with the 1917 version of The Holy Scriptures by Jewish scholars, as well as their more recent translation. Sometimes puzzling questions crop up when you study the Bible. You can find the answers if you search for them. Agnostics and atheists attack the Bible by claiming it cannot be divinely inspired because of its seeming contradictions, discrepancies and absurdities. You may have been confronted with these claims. Or you may have found what you thought was a contradiction in the Bible. But you don't need to doubt the authenticity, authority and inspiration of God's Word. You can find the answers to these difficulties. You can strengthen your faith in God and His Word with a few simple guidelines. The Bible is the foundation of all right knowledge. It is the revelation of God's mind, will and character. And God is far greater than man in knowledge, wisdom and spiritual character. Yet God has given the Bible — His revealed and inspired Word — to men who are imperfect. Therefore, when men try to understand the revelation of an infinite, all-powerful, all-knowing God, there is bound to be difficulty. It's like a young child trying to understand a lecture given by a college professor. He may understand the words themselves, but he will not grasp all the meaning of the ideas expressed. You may find it difficult to understand certain parts of the Bible. This is to be expected. The apostle Peter wrote that in Paul's epistles there were "some things hard to be understood, which they that are unlearned and unstable wrest, as they do also the other scriptures, unto their own destruction" (II Pet. 3:16). Realize that some parts of the Bible will be hard to understand at first. You will find things in the Bible that will puzzle you. You may even find some apparent contradictions that you cannot reconcile. But don't become deceived into thinking the Bible is filled with errors. Squarely face these difficulties and "search the scriptures" (John 5:39) to find the answers. Many difficulties arise because of man's ignorance of the facts. But anyone who gives up his belief in the divine origin and inspiration of the Bible because of some facts he cannot reconcile is a shallow thinker indeed. The one who denies that the Bible is of divine origin and authority has more numerous and weighty difficulties to explain than one who believes the Bible to be the inspired Word of God. The very fact that you may not be able to solve a difficulty does not prove it cannot be solved. If you can see no possible solution, don't jump to the conclusion that a solution is impossible to find. Should a beginner in algebra, after having tried for hours to solve a problem, declare there is no possible solution because he couldn't find one? Of course not! And neither should Bible students think there are unsolvable difficulties in the Bible simply because they themselves are not able to solve them. When some people come to a difficult scripture, they decide immediately what the doubtful text must mean. Having made up their minds quickly as to the meaning of this particular verse, they must then change their minds about other verses and misinterpret them in order to make them fit with the new one. Trying to put your own ideas into the Bible is the surest way of misunderstanding it entirely. Reserve your judgment about any difficulties in understanding the Bible you come across. Don't reject truth or the Bible itself because you don't understand certain parts at the moment. Those who make a big issue of some minor points they don't understand often overlook the really important purpose for which the Bible was written. The more you study the Bible, the more questions will be answered. As your knowledge increases, more and more difficulties will disappear. God intends that we understand all the Bible. Why are there apparent contradictions and discrepancies in the Bible? Why has God permitted them to exist? And what good are they? These are questions you may have, and they need answering. The apparent contradictions and discrepancies in the Bible stimulate the mind. They prompt men to search the scriptures for the solution. They attract the inquiring mind. The parables of Christ, for example, were for this purpose of hiding the true meaning of Christ 's teaching (Matt. 13:13-15). The Bible was not written in a clear-cut, right-down-the-line manner. In order for it to be preserved for us today, it had to be written in a way so people could interpret it to suit themselves, and so the atheists, agnostics and critics could find fault with it and " stumble at the word, being disobedient: whereunto they were appointed" (I Pet. 2:8). Also see Isaiah 28:9-13. Make no mistake about it. If the Bible is inspired by God, there can be no errors in it as originally written — because God could not make a mistake. The Bible plainly says, "The scripture cannot be broken" (John 10:35). The Bible cannot contradict itself! There can be no real discrepancies. "It should never be forgotten that in spite of what critics have said, no error or contradiction of any kind has ever been proved to have existed in the Scriptures as originally given by God" (Scripture of Truth by Sidney Collett, p. 81). The major cause of difficulties in understanding the Bible is carelessness in studying the Bible with a prayerful and humble mind. So to eliminate these difficulties, it is necessary to study the Bible in the right way and to have the right attitude about it. Those who study the Bible merely to find errors will never come to understand it properly. Such people do not fully comprehend and apply the purpose of God's Word. This purpose is given in II Timothy 3:16, "All scripture is given by inspiration of God, and is profitable for doctrine, for reproof, for correction, for instruction in righteousness." If you recognize the authority of the Bible as being the inspired Word of Almighty God the Creator and study it with the purpose of showing you where you are wrong and to find the right instruction that will help you grow to spiritual maturity, then the supposed contradictions and other Bible difficulties will be no problem to you. You must have this right attitude of heart and mind: God says, "To this man will I look, even to him that is poor and of a contrite spirit, and trembleth at my word" (Isa. 66:2). If you tremble at God's Word and respect the authority and power behind that Word so much that you are afraid to reject or disobey it, then you have the right attitude and can fully benefit by your study of the Bible. Don't try to correct or improve the Bible. Let it correct, reprove and teach you. Many people come across difficulties in the Bible because they don't know how to study it. And you must study it to find the truth. The apostle Paul said, "Study to show thyself approved unto God, a workman that needeth not to be ashamed, rightly dividing the word of truth" (II Tim. 2:15). This study of the Bible should be with zeal! It is something to put your whole heart into. Devote your time and mind to it. God says, "Whatsoever thy hand findeth to do, do it with thy might; for there is no work, nor device, nor knowledge, nor wisdom, in the grave" (Eccl. 9:10). Bible study and prayer go hand in hand. They cannot be separated. Bible study, to be effective, must be accompanied with prayer. Pray and ask God for guidance and understanding. Ask Him to reveal the true meaning of what is said in His Word and then expect that He will. Pray for the help of the Holy Spirit. Man of himself is totally ignorant of God and cannot even understand His Word without spiritual guidance, Jeremiah said, "I know that the way of man is not in himself: it is not in man that walketh to direct his steps" (Jer. 10:23). We need guidance through tile help of the Holy Spirit. The Holy Spirit is necessary to understand spiritual truth. The natural human mind is incapable of understanding spiritual revelations. Paul explained this in I Corinthians 2:14: "The natural man" — that is, the natural-born, unconverted mind — "receiveth not the things of the Spirit of God: for they are foolishness unto him: neither can he know them, because they are spiritually discerned." They are revealed by God's Spirit as the 10th verse says, "God hath revealed them unto us by His Spirit." The Holy Spirit within us is the key that alone can unlock the doors to scriptural understanding. But the Holy Spirit is given only to those who obey God (Acts 5:32). The greater your obedience to God, the greater your wisdom and understanding of the Bible will be. When studying the Bible, one approach is to study one book at a time in order to understand its general contents. Find out who wrote each book. When, where and for whom did he write? Under what circumstances did he write the book? Does his book contain laws, poetry, history, religious instruction or prophecy? What are the practical lessons and doctrines taught? What connection has this book with other parts of the Bible? What is the time period when the events were written? Not only is it important to read a book from beginning to end, it is also important to read a connected set of books consecutively to the end to get the general thought that pervades throughout. George Mueller of Bristol once said, "There may seem to be apparent contradictions in the Word, but by patiently and calmly going on reading and meditating, these are removed." The Bible should be studied systematically and thoroughly. Without this systematic study, we may miss some of the gold nuggets hidden in the deepest parts. Nothing that God has had recorded in the Bible can be lightly passed by. When you read the Bible, hunt for something. Read a chapter over and over again until you understand it. After a chapter has been read, analyze it and write your own table of contents. This will impress on your mind what the chapter is about and will help you retain this knowledge. Study every single passage with II Timothy 3:16-17 in mind. Ask yourself: What reproof, correction and instruction is here for me? Apply the Bible personally — to yourself. Take the plain and simple meaning of the passage as if it were written for yourself. Believe in the Bible as God's revelation to you, and act accordingly. Approach Bible study this way and there will be no problem solving any difficulties or apparent contradictions that may arise. There is a fair and reasonable solution for every supposed difficulty and discrepancy found in the Bible.